Humpback Whales travel in an unending cycle of migration between their birthplace (the inter-reef Lagoon of the Great Barrier Reef) and Antarctica, along the eastern coastline of Australia. Their world is comprised of vast stretches of ocean where sounds emitted by the Humpback Whales can be heard over great distances. Dr. Roger and Katy Payne were the first scientists to recognise that the unique sounds made by Humpback Whales were in fact conscious, complex evolving songs. They found that the songs varied markedly from year to year and that “new variations are a learned trait which evolves”. have been documented singing continuously for up to twenty three hours. Typically, the Songline begins in the high frequencies and descends to the lower frequencies as the cycle progresses. The Humpback Songlines are transferred from year to year and evolve in a similar fashion to the verbally-transmitted tribal lore of Aboriginal cultures. For this series of short films featuring the Humpback Whales of Hervey Bay, Mark Francis Franklin has produced digital multitrack Whale Song mixes. He has cut and layered the Humpback Song; bringing the different sections of the Songline to the front of the mix, within the length of each film. 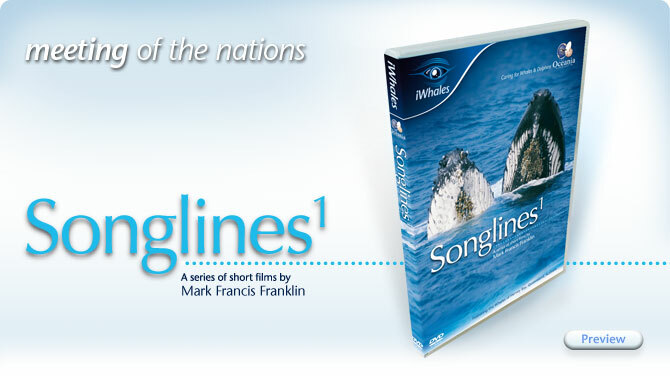 This technique allows the full complexity, depth and richness of the Humpback Songlines to be heard during each film. It also serves to accompany the images of the Humpback Whales interacting with people aboard The Oceania Project's Whale Research Expeditions in Hervey Bay. Listen and watch with wonder - and be touched by the mystery of these evocative communications from Ancient Ocean Beings.